My new puppy, Axl, is fast asleep after a morning of playing, cuddling, and lots of licks. We have only had him for 5 days, but he is teaching me so much. Most of all, he is teaching me about change. It’s funny, change when I was 18, or even 28, versus change today at 38 feels so completely different. In my younger days, I would think about something that I wanted or something I wanted to do and that thought or idea would immediately be taken into action. I would just do it and ask questions later. Sometimes it worked, sometimes it didn’t. Today, it is a little different. 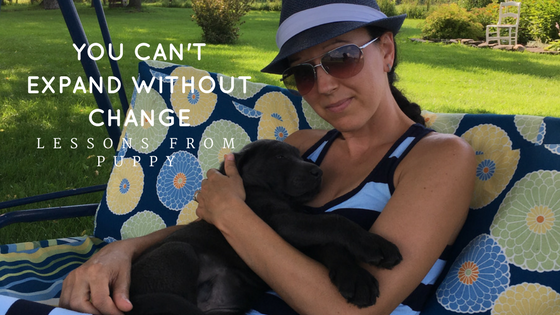 Not because I resist change, I actually think change is so important (it helps us learn, grow and evolve), but because I have, and continue to work the work of creating and living a life that I love. Sometimes that takes a little time, patience and processing to gain clarity from within. It took us a year to fully commit to the decision of getting a puppy. My husband and I wanted to have the time to train him properly and we wanted to ensure that he would fit into our life, not take over our life. We talked about the pros and cons, how it would affect our lives, the best breeder, what we needed to do to prepare, how much time we needed to take off, how much money he would cost per year, what vet and kennel we would send him to, where he would sleep, what he would eat, and we even shopped for the “perfect” crate. This sounds a little like overkill, but the more balanced, or rather in a place of ease my life becomes, the more I ensure to tap into my core-desired feelings before just leaping. I still leap, but not when it comes to the really big stuff, like getting a puppy. Because of my process, I am loving every moment of puppyhood with Axl because I really, really, really wanted him, even with any early day challenges that may arise. There is no denying that puppies are cute. Cute makes us feel all fuzzy and warm. We get swept away by cute, or things that look appealing and oh so good – we all do. That is human nature and totally normal. However, it can make you want to jump right in without giving it much thought. But unless you really want it, like a puppy for example, the housetraining, crate training, no biting training, sleeping through the night training won’t be fun. What was once cute and seemed like a good idea will turn into stress and resentment. But listen, this isn’t about getting a puppy, it is about learning how to go within to ensure that you are doing something that is going to bring you joy, not trying to fill a void only to regret it later. To avoid regret and to help me make a decision so that change flows with more ease, and less stress, is I tap into my core-desired feelings. This helps me to make the decision that is right for me, not just now in this moment, but also down the road. Along with the “practical” thinking side of my brain type of conversations that my husband and I had, I also used my emotional compass – my core-desired feelings. Will this fill my heart with love? This is so important to me because I’m a feeler way before I’m a thinker. When the answers are big fat YES, I am able to adapt to change with more ease because I made the choice from an already happy place, not to become happy, but to enhance the happiness that I am already experiencing. These questions are also important to helping me make a decision and adapt to change because I have taken the time to make sure that it is something that I really, really, really want. Like jump out of bed, lets do this even though it is currently challenging because I love it wanting it! When stressors come up, I can recalibrate back to Happy Land by reminding myself that I made this decision from a positive place by using my core-desired feelings, which is my powerful WHY of why I made the choice in the first place. So, Axl is teaching me to embrace the lessons that I teach at Contagiously Positive every day. Lessons like: live in the moment, embrace change, the challenge of the newness only last for a little while, it is my choice to create and live a life that I love, use my emotional compass to guide me, and of course to be patient, take time for play, give cuddles, lots of kisses, and eat good food. He (and me as well) loves all of those things, and it is great to break away from busy to remember them, embrace them, and relish in them. How do you adapt to change? Do you resist or enjoy it? How do you make decisions that serve you and your core-desired feelings? If you are at a fork in the road and you don’t know which way to go, I would love to help. You can contact me anytime for one-on-one coaching, or you can take my 2-hour digital workshop on Creating and Embracing A Life That You Love. Whether we work together individually, or you take the online program, my mission is to help you remove the blocks to getting everything that you want, need and desire. ← How To Get Sneaky With Your Vegetables: Let’s Make Zoodles!